To start with the negatives - the little action whoosh above the Chips image is a little unnecessary. We would prefer the 'Cooked' to be in the same font as the 'Kettle'. We would like the flavor to be more prominent and in a section designed for it; a bubble a box, or something. 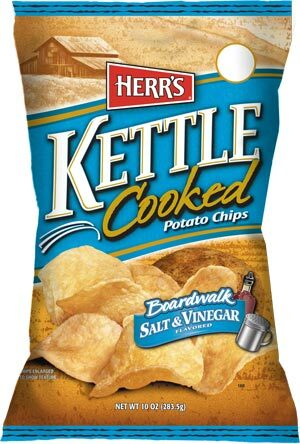 However, those are really quite personal and minor criticisms of what is otherwise a perfectly designed Potato Chips bag. The Herr's heritage is captured in a background image. The discretely sized company name stands out in red. The bag is flavor color coded. The sepia feel adds warmth and glow. An outstanding design. A good, firm, Kettle Chip style crunch. A folded Chip was like biting into something hard and cracker like. A Snap Test saw a clean residue popping break. A quality Kettle Cooked Chip. Nice and firm, with oil bubbles on the surface without many broken. There was a powdery seasoning visible and the edges were curled, bent and potato skinned. Whatever style of Chip, if it is Salt & Vinegar flavor it needs to strike a fair and even balance between the two partners. We found these a little bit more vinegary than salty, but it is a relatively mild flavor, and it wasn't too over-powering.